After reporting a 2018 fourth quarter loss of $23 million, negative EBITDA for the quarter of $12.5 million and a $51 million drawdown on its bank credit facility, it is clear that Five Star, SNH’s largest tenant, must obtain a significant rent concession if it is to continue as an independent company. Additional asset sales could further delay a restructuring but only temporarily. Five Star’s independent directors and SNH’s independent trustees are currently considering changes to their arrangements that could allow FVE to continue as a going concern, but any meaningful reduction in rental payments could require SNH to cut its annual distribution to shareholders. Five Star has received a rent waiver from SNH for February and March. My analysis indicates that Five Star should cut its lease payments to SNH by about 50% or $100 million to return to profitability and fund necessary capital expenditures (without taking on any more debt). Property upgrades are necessary to maintain Five Star’s (and SNH’s) competitive position. A 50% reduction in rental income from Five Star would pressure SNH to cut the annual distribution on its stock by as much as 60% or $220 million. (Even with no cut in FVE rental income, SNH is not generating sufficient free cash flow to sustain its current distribution.) The ultimate amount of the distribution cut will depend upon how quickly FVE can improve its financial performance and also on SNH’s ability to improve the profitability of its other property types (e.g. medical office buildings (MOBs)), cut operating expenses, raise cash from additional asset sales or increase (bank) borrowings. 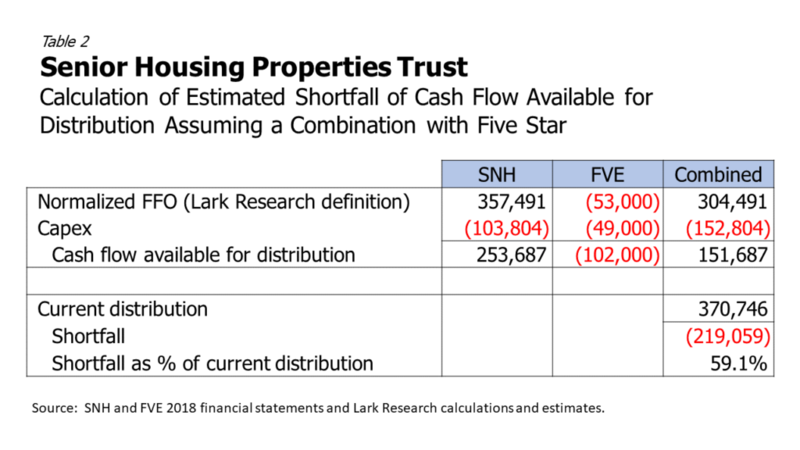 With a $100 million rental income cut, my projections indicate that SNH’s free cash flow would fall short of its current annual distribution by about $170 million (or by roughly half) over each of the next two years and its debt-to-total capitalization would rise to 62.3% in 2020 from 54.7% currently. Besides the rental income cut, my projections assume the substantial elimination of the RMR incentive management fee, modest growth in profits from MOBs and managed SLCs, and no asset sales or acquisitions. Such an increase in leverage would most likely cause SNH to lose its investment grade credit rating. A logical alternative to restructuring the lease agreements would be for SNH to acquire the outstanding publicly-held shares of Five Star. SNH could then cancel the lease agreements without public disclosure (since SNH’s lease income and FVE’s lease payments would be eliminated upon consolidation). After new lease agreements are put in place, SNH could then spin-off (or sell) FVE and its other managed properties. This alternative assumes that SNH can acquire FVE without jeopardizing its REIT status under Federal tax laws. SNH might also be able to preserve the future use of FVE’s $167 million of federal net operating loss carryforwards, if the current major FVE shareholders holders do not tender their shares in the buyout. SNH might even be able to pay for the acquisition with RMR shares that it owns (and avoid using cash or borrowings). If my analysis is correct and SNH cuts its distribution by 60%, the distribution yield on its stock would drop from 13.0% to 5.2% at SNH’s current share price of $12.01 (March 21). Assuming no further deterioration in SNH’s profitability from either the Five Star properties or its other properties, that 5.2% yield should be sustainable. Thus, SNH’s current share price appears to discount fully the risk of a near-term distribution cut. Besides the resolution of FVE’s going concern status, investors should press SNH and RMR to change the RMR incentive management fee away from its current formula (which is based upon SNH stock’s relative performance vs. the SNL U.S. Healthcare REIT index) to one that incorporates other financial and non-financial objectives (e.g. occupancy, average day rates, cost management, etc.) that will have a greater impact on SNH’s competitive position and long-term financial performance. Five Star’s financial performance clearly deteriorated in 2018. Although revenues were essentially flat, its net loss increased from $20.9 million to $74.1 million. 2018 revenues were little changed, as a 2.5% decline in senior living revenue was mostly offset by a 7.6% increase in management fee revenue and an 8.1% increase in reimbursed costs, both associated with the sale of several properties to SNH in late 2017 and early 2018. On a comparable community basis, revenues declined 1.0% as a 90 basis point decline in average occupancy to 82.0% was partially offset by a 0.2% increase in the average monthly rate received from customers and a 0.7% increase in management fee revenue. Operating expenses increased by 3.0% in 2018, due mostly to higher wages and benefits, repairs and maintenance and consulting costs. Like its peers, Five Star has faced a labor shortage which has resulted in higher wage rates and increased overtime. Repairs and maintenance costs were up, as Five Star works to keep its properties in good condition to meet local competitive challenges. With faster growth in expenses, Five Star’s operating loss increased from $23.1 million in 2017 to $71.6 million in 2018. EBITDA swung from positive $10 million in 2017 to negative $42.3 million. Capital expenditures totaled $49 million in 2018 (down from $71.1 million in 2017) and cash interest, taxes and other items were $11.9 million. All together, Five Star burned $100 million of cash (i.e. free cash flow) in 2018, excluding asset sales. For the 2018 fourth quarter, Five Star reported negative EBITDA of $12.5 million, which was on par with the previous two quarters. Thus, its cash burn may have stabilized or perhaps even bottomed. 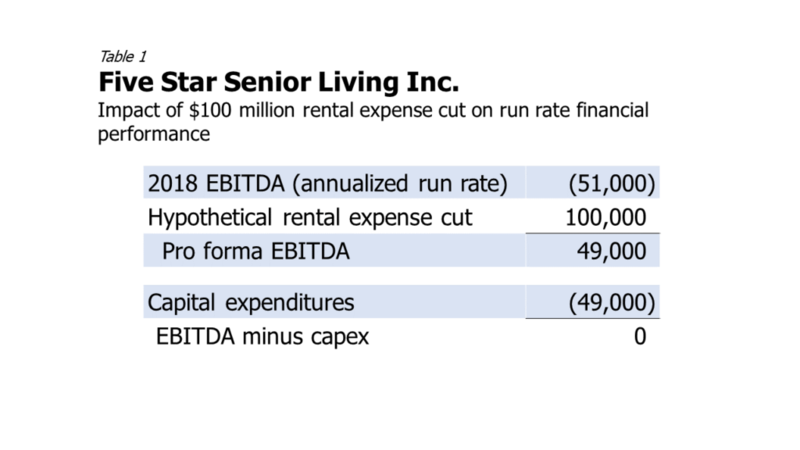 Five Star has been striving to improve its competitive position to counteract the pressure on occupancy, day rates and labor costs that it has experienced from the boom in senior housing community development in recent years. It has been upgrading its properties and improving its service offerings within the confines of its budget, aided by reimbursements from SNH. Its efforts have begun to bear fruit, for example in quality awards that it has received recently from J.D. Power on several properties. The company reported that average occupancy for the 2018 fourth quarter improved to 82.9%, up 30 basis points (bp) over the prior year and up 90 bp sequentially. This was the first sequential increase in occupancy in two years and probably the first year-on-year increase in occupancy in more than two years. The recent stabilization of Five Star’s occupancy is consistent with the national trend, as reported by the National Investment Center for Seniors Housing & Care (NIC). In its 2018 fourth quarter report[, NIC reported that industrywide occupancy has been holding within a narrow range, hovering around 82.5% since April 2018. According to NIC, this is a welcome change after years of declining occupancy. Consolidated. 2018 revenues increased 4% to $1.12 billion, as higher rental income from MOBs acquired since 2017 and higher resident fees and service revenues from managed SLCs (from properties recently acquired from Five Star) more than offset a modest decline in rental income from triple net leased SLCs. On balance, declining occupancy at MOBs and triple net leased SLCs was mostly offset by higher average rental rates. Despite the 4% increase in revenues, property net operating income rose less than 1% to $665.6 million. Property operating expenses jumped 9%, due to acquisitions and higher direct costs (i.e. real estate taxes, repairs and maintenance, labor costs, etc.). For the same reasons, normalized FFO (according to my definition, which excludes non-cash benefits from straight line rental income, amortization of acquire leases and intangibles and amortization of a gain on RMR stock) increased 1.5% to $357.5 million. Excluding the RMR incentive management fee, which declined by $15.1 million to $40.6 million in 2018, normalized FFO declined by 2.4%, due mostly to higher interest expense. Despite the modest gains in property NOI and normalized FFO, GAAP net income nearly doubled $147.6 million to $286.9 million. SNH booked a gain of $261.9 million on property sales, up from $46.9 million in 2017. This was partially offset by a $20.7 million unrealized loss recorded on its equity investments (RMR and FVE) and a $66.3 million impairment charge taken on certain MOB and triple net leased SLC properties slated for sale. From a cash flow perspective, SNH used $103.8 million for capital expenditures and $129.5 million for acquisitions, both of which were more than offset by $332 million in proceeds from asset sales. Excluding the acquisitions and asset sales, SNH’s free cash flow (i.e. cash flow from operating and investing activities) fell short of its total distribution payments by $80 million or about 22%. That 2018 shortfall in free cash flow was up from $46 million in 2016 and $68 million in 2017. In 2018, SNH issued $500 million of 4.75% Senior Notes due 2028. Proceeds were used to repay amounts outstanding under its bank credit facility. It has a $400 million bond issue, the 3.25% Senior Notes, that matures in May 2019. At year-end, the Trust had $139 million outstanding and $861 million available under its $1 billion bank credit facility; so it seems likely that SNH will borrow from its banks to repay this debt and look to float another debt offering later in the year, after it completes its negotiations with Five Star. Despite recent challenges, SNH is still holding on to its investment grade credit ratings (Baa3/BBB-) and presumably its credit ratings already reflect the current problems at Five Star. Behind the 3.25s, SNH has $200 million of 6.75% Senior Notes coming due in April 2020. By granting a deferral on rents payable from Five Star, SNH has acknowledged that the payment of rent at current contractual rate is unsustainable and also that further short-term fixes, such as buying properties from Five Star, are not an option. Presumably, therefore, SNH (and its manager, RMR) are looking at crafting a longer lasting, if not a permanent solution. A key question is whether it is even possible (or desirable) to renegotiate at this time the lease and management agreements with SNH that govern the 260 properties that Five Star operates. That most likely depends upon an assessment of whether Five Star’s financial performance has bottomed and if so, what the trajectory of its future profitability will be. If Five Star and SNH can agree now on what the future looks like, then it presumably can determine what the rent payments and management fees should be going forward. However, the final structure of a deal will likely be complicated by Five Star’s current and expected near-term cash burn. SNH may very well be reluctant to cut its rent charges or raise its management fees to the level currently required to cover Five Star’s current negative EBITDA and capital spending requirements. Another key question is how much FVE and SNH need to spend to strengthen the competitive position of the SLC portfolio. Under the current arrangements, Five Star will need funding, either through cost cuts, management fee increases or financing to meet its capital spending requirements. Alternatively, SNH may push for a smaller rent cut and agree to fund the necessary capital expenditures in some other way (for example, through a line of credit). Over the past two years, SNH has purchased nearly $130 million of property, plant and equipment from Five Star to help Five Star meet its financial obligations. Extending that arrangement might be problematic, especially if ongoing capital spending requirements are high. In that case, it may be more appropriate for SNH to convert more of the triple net leased SLCs to managed SLCs (with management contracted out to Five Star). Otherwise, SNH could be deemed to be in control of Five Star, which may require it to consolidate Five Star’s financial statements into its own anyway. Furthermore, if there is still considerable uncertainty about Five Star’s future performance, it may be difficult at this time to structure new agreements that do not have to be amended frequently going forward. For those reasons, I think that the most logical course of action is for SNH to acquire Five Star. After completing the acquisition, SNH can terminate the existing lease agreements and management contracts and start from a clean slate. (This would have the added benefit of avoiding substantially all of the anticipated $1.5 billion write-up in Five Star’s assets and lease obligations associated with the implementation of the new lease accounting standard.) As Five Star’s turnaround nears completion, SNH can then structure new agreements in anticipation of a spin-off or it could conceivably seek to sell Five Star to another entity with the new lease and management agreements in place. Indeed, Five Star’s recent stock price performance seems to be anticipating the likelihood of a buyout. Since bottoming at $0.31 in mid-December, the stock rallied to its current level of around $1.00 by late February and has been holding that level ever since. It is currently trading at a 28% discount to its equity book value of $1.40. If indeed the existing major shareholders – ABP Trust (which is the controlling shareholder of RMR), SNH and the Thomas Brothers, who collectively own 50% of the outstanding shares – step up to purchase the company, it seems reasonable that the acquisition price will be above the current share price and closer to its book value. Estimating the SNH Distribution Cut. In the table below, I provide a simplified estimate of the potential shortfall in SNH’s available cash flow to cover the annual distribution, assuming a combination with Five Star. I define cash flow available for distribution as normalized FFO minus capital expenditures. This is obviously a simplified analysis because there are other cash flow items (e.g. changes in working capital) that provide or use cash. I also exclude cash paid for acquisitions and cash received from asset sales from this calculation. On its own, SNH generated $253.7 million of cash flow available for distribution, under this methodology. I estimate that Five Star would reduce that amount by $102.0 million, including normalized FFO (which is roughly equal to its negative EBITDA of $51 million minus net interest expense of $2 million) plus 2019 capital expenditures of $49 million. Combined, this would give SNH about $152 million of cash flow available for distribution, which is $219 million less than the total 2018 distribution of $271 million. This calculation suggests that SNH may have to cut its distribution by as much as 60%. If it does decide to cut the distribution, it presumably will determine the cut based upon the expected performance of the combined companies, its capital spending plans, future acquisitions and asset sales and other items that will impact future cash available for distribution. It could also decide to take a smaller cut in the near term, if it expects its future financial performance will improve. It could even continue to pay the existing distribution without a cut, but my current projections suggest that its debt-to-capitalization would climb to 62.4% by the end of 2020, which would probably trigger a credit rating downgrade. The RMR Incentive Fee was put in place in 2015 in response to criticism about conflicts of interests between RMR Group and its affiliated REITs, including SNH. At that time, SNH and its sister REITs were trading at multi-year lows. In response, RMR created a formula that better aligned its incentive compensation with shareholder interests. As part of this effort, RMR also distributed its own stock to the REITs to ensure that the REITs would likewise benefit from RMR’s success. As noted above, RMR has received $96.4 million in incentive fee payments from SNH over the past two years under a formula that measures the performance of SNH’s stock price against the SNL U.S. Healthcare REIT Index over a three year period. This complex formula is based upon an index that is not readily available. (SNL is now part of Standard & Poor’s, but I have been unable to find the index online.) If SNH and RMR continue to use this formula, SNH should routinely disclose in its quarterly filings the calculation used to determine the incentive fee and in an annual filing, a description of the SNL index, including its composition and performance. It is doubtful, in my opinion, that this incentive fee arrangement will serve the long-term interests of SNH and its shareholders. Share price returns are only one measure of SNH’s performance. Given current competitive challenges and the pressures on payments and occupancy, RMR’s incentive fee should incorporate other metrics, including property upgrades, service performance, operating efficiency and maintaining SNH’s financial flexibility. The payments to RMR have been a drain on cash as the financial performance of SNH and Five Star has come under pressure. The RMR incentive fee does not have any provision that requires RMR to give back amounts previously paid when SNH underperforms its benchmark index. (Yet, SNH’s holding of RMR stock can go down in value.) Although the 2018 plunge in SNH’s share price makes it likely that SNH will pay little or nothing to RMR under this arrangement this year, I believe that investors in SNH should press the Trust and RMR to change the formula to avoid future payouts that might be a further drain on cash at a time when SNH needs cash to continue to shore up its competitive position and pay its distribution to shareholders. The market may be discounting a further deterioration in SNH’s performance. Indeed, the Trust’s baseline profitability is lower in 2019 as a result of recent asset sales. SNH has also disclosed that two of its MOB tenants, representing 2.5% of its 2018 total rental income, will be vacating in the 2019 second quarter. Consequently, it expects to incur significant costs to refurbish these properties to attract new tenants. Yet, with tentative signs of stabilization in the SLC business and efforts to shore up the profitability of the entire portfolio, a more significant decline in SNH’s profitability does not seem likely, at least in the near-term. My detailed projections of SNH’s 2019 and 2020 financial performance, which assume a $100 million rental income cut, the substantial elimination of the RMR incentive management fee, modest growth in profits from MOBs and management SLCs and no asset sales, acquisitions or distribution cut, are available upon request. It is reasonable, I believe, to combine SNH and FVE in this way, under the assumption that intercompany transactions – i.e. rental income/rent expense, management fee income/management expense and reimbursed expenses – would be cancelled out. This simplified approach does not take into account the potential transaction costs associated with the acquisition. This entry was posted in FVE, Real Estate, SNH and tagged Five Star Senior Living, Senior Housing Properties Trust. Bookmark the permalink.